Activists and organizers for Chican@ studies are playing a central role in the fight to compel Pima Community College to drop the "i" word from college curricula. The effort is inextricably tied to the ongoing movement for migrant justice in the United States. If anyone had any doubts that the struggle to save Chican@ Studies is separate from immigration and border enforcement issues, the cross-section of the community that turned out to a board meeting of Pima Community College in Tucson, Arizona back in February should have shattered those doubts. The associated efforts are now on the brink of a monumental victory for education and cultural rights. word (i.e. using “illegal” to describe human beings) from inside classrooms. Although other post-secondary schools administratively use “undocumented” over “illegal,” Pima’s case challenges the term “illegal” within classroom curricula. It all started at the February 27 board meeting. A local DREAMer group, Scholarships A-Z, had long been advocating for a resolution (approved by a landslide that night) allowing undocumented students to pay in-state tuition and access scholarships just as anyone else, regardless of immigration status. The DREAMers had mobilized a massive support base of families and local organizations that came out in full force to back the youth. One such group of supporters is UNIDOS (United Nondiscriminatory Individuals Demanding Our Studies), a youth coalition formed in 2011 to save and expand the only K-12 program of Chican@ studies in the country, outlawed by Arizona state authorities in 2010. 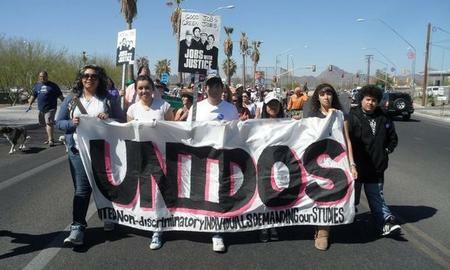 UNIDOS gained national attention in April 2011 when nine youth members chained themselves to the Tucson Unified School District (TUSD) board members’ chairs and dais to stop a vote that would have eliminated the country’s only K-12 Mexican-American Studies program. Three fellow UNIDOS members and I (spanning from high school- to college-age) spoke during the Call to Audience section that night. During our speech in front of the board, we noted facial expressions of abject shock among some board members as we recounted stories of harassment by authorities outside the campus confines. It was the way these stories impacted us as Pima students within the classrooms, however, that we urged the board to heed closely and act upon. UNIDOS member Arturo Duran’s story was specially compelling on this point. Last June—shortly after President Obama’s promise to halt deportations of DREAM-eligible youth—then 19-year-old Duran and his family got the nightmare of a lifetime. While driving in Marana, near Tucson, Arturo was pulled over by a local Pima County sheriff’s officer. When asked for documentation, Arturo could only show the officer his Pima school I.D. In compliance with the now nationally-sanctioned SB 1070 law, the sheriff called Border Patrol, whose agents came and picked up Duran, and placed him in immigration detention overnight. We as UNIDOS representatives gave the board until the following week to enter into negotiations with us over the conditions and a timetable for dropping the ‘i’ word from the institution, including updating Pima’s anti-Hate Speech and anti-Harassment policies. Challenging the ‘i’ word comes at an opportune time in history, I told the Pima board back in February. Like the ‘n’ word, for a long time, the word ‘illegal’ was unassailable because it was too entrenched in American society. But now nationwide many people are organizing anti-harassment efforts to challenge it. In this way, the ‘i’ word today is at a comparable historical place that the ‘n’ word was by the late 1930s. Scholarships A-Z organizer Allie Salazar felt “overjoyed” that night, tears dampening her face as the board voted overwhelmingly in favor of the proposal she and her community fought so long and hard for. But, as she told us in UNIDOS, this is just the beginning. “There’s still a lot more to be done to help our undocumented youth,” she said. 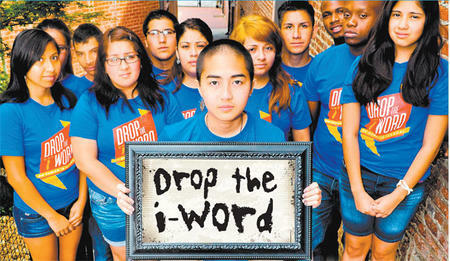 The current campaign urging Pima Community College to drop the ‘i’ word is one indicator of the ongoing movement for migrant justice in the United States. Now, the so-called “immigration reform” that appears to be on offer is a sign of more challenges to come, given that the root causes (political and economic factors) of migration remain unaddressed. Students are fighting for the future now. Because we won’t settle for anything less. Gabriel M. Schivone is an alumnus of Tucson High School and has been a member of UNIDOS since 2011.